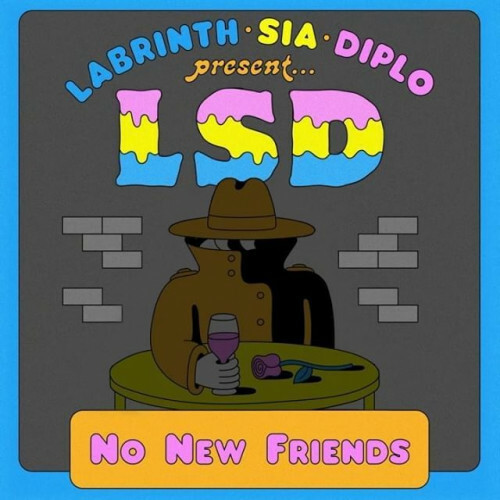 "No New Friends" is a song by LSD from the group's upcoming album of the same name, released by Columbia Records on 14 March 2019. The song serves as the album's fifth single, following "Genius", "Audio", "Thunderclouds", and "Mountains". Billboard's Kat Bein described "No New Friends" as a "bright, rhythm-led tune that pops warm and sunny like spring for your ears", and "infectiously catchy with a touch of the islands that celebrates the buddies we already have". Derrick Rossignol of Uproxx called the song "upbeat" and "an ode to appreciating what you have". He wrote, "The song gives everybody a chance to shine, thanks to Sia's idiosyncratic vocals, Labrinth's hip-hop energy, and Diplo’s EDM-influenced pop production that ties everything together."